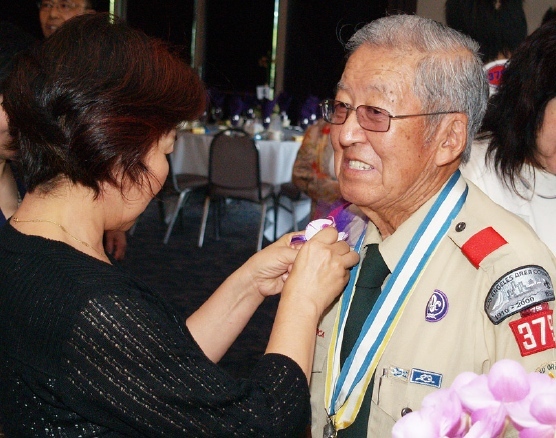 Mas Fujimoto, shown receiving a boutonniere from scout parent Mieko Yamagata, was honored by Troop 379 at a luncheon in August 2009. Masanori Fujimoto, longtime scouting coordinator for Boy Scout Troop 379 of the Koyasan Beikoku Betsuin in Los Angeles, passed away on April 11. He was 92. During his decades of service with Troop 379 and Boy Scouts of America, Fujimoto mentored generations of young boys, conducting more than 123 investiture ceremonies for the Troop 379 Eagle Court of Honor from 1969-2006. He was involved as a leader with Troop 379 since 1958 and was its coordinator from 1969, until his retirement in 2009. In 1973, there were 13 Eagle Scouts awarded. Since the troop’s beginning in 1931, more than 200 Eagles have been awarded, with Fujimoto conducting 60 percent of them. Eagle Scout is the highest rank in scouting. Scott Takahashi, assistant scoutmaster, received his Eagle ranking in 1982 and recalls Fujimoto as always demanding the best from his scouts. Born in Wakayama, Fujimoto emigrated with his family to the U.S. in 1925 and became a member of the Koyasan Troop 379 in 1937. He earned the rank of STAR Scout prior to his departure back to Japan in 1941. After World War II, he served as an interpreter for the occupation forces, returning to Los Angeles in 1952. In 2009, Troop 379 honored Fujimoto for his work to promote scouting in the U.S. and Japan. He would lead the troop on trips to Japan every four years to participate in the Nippon Jamboree. Takahashi said many of the Eagle Scouts have gone on to work with other troops throughout Southern California and other states. Fujimoto is survived by wife, Sakae; sons, Masafumi (Hisako) of Oahu and Kenneth Kenji; grandsons, Andrew and Wesley (Akiko), both of Oahu, and Marcus; great-grandsons, Alex and Jake, both of Oahu; brother, Tsugio; and many nieces, nephews and other relatives. Funeral services were held on April 20 at Koyasan Beikoku Betsuin. Scouts, former scouts and scouters were invited to attend in their uniforms to celebrate his scouting legacy.